..and from Sonic, Diddy Kong Racing, and more. I bought Mario Kart 8 Deluxe recently, and it’s a very exciting game full of cool characters and items and great tracks with beautiful vistas. Racing gets turned on its head. 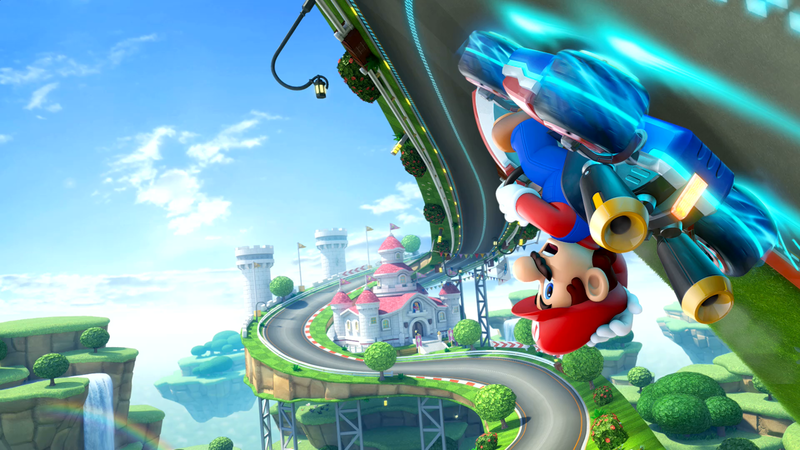 It’s improved on past iterations in the same way that every Mario Kart game has since MK64: add new tracks, new characters, new items, and a few tidbits here and there like more kart customization and, this time, crazy upside-down tracks. It’s futuristic! Everyone keeps touting that Mario Kart 8 Deluxe is a fantastic game. It has a Metacritic rating of 92. The series as a whole is praised for its skill-based powersliding. According to Wikipedia, no Mario Kart game has received worse than an 80% score on either Metacritic or Gamerankings. Suffice it to say, Mario Kart is a series with universal critical acclaim. Some people would say that Mario Kart 8 Deluxe is the pinnacle of kart-racing. At risk of being contrarian, I’m here to disagree. I think Mario Kart is a stagnant series with little to provide to kart-racing in general, other than the titular character and the fact that it sorta pioneered the genre. Granted, I may be biased—I finally 100%-ed Diddy Kong Racing and that game is pure nostalgia for me—but I want to take the time to really take a look at where Mario Kart can be improved upon. I’m going to ignore rubberbanding (ie. speeding up AI in the back and slowing down AI in front) because it varies between games and, well, that’s a complicated discussion for another time. I think I can most accurately describe my perspective of Mario Kart as “a racing game with handicaps”. I don’t mean the simplistic physics and controls: if anything, the simplicity of driving works in Mario Kart’s favor, because it means these controls are focused, predictable, and refined. After one race in Mario Kart, you’ve more or less learned how to drive. A few more races, and you can powerslide your way to victory. Mastering powerslides is more difficult, but that challenge is welcome and helps provide replay value for the game. This article will take a look at two areas where kart-racing can be improved upon, relative to Mario Kart: the items and the level design. I don’t need to wax lyrical about blue shells. Anybody reading this article has likely experienced their frustration a thousand times. Unavoidable balls of death aimed straight for first place, and there’s nothing you can do about it. Items, of course, are randomly assigned to you based on your position in the race, and getting the items required to avoid a blue shell requires not being in first place. The other options risk disadvantaging you so much you might fall several more places than intended. Blue shells are so common that you’re pretty much guaranteed to feel one every race. So the game is designed to punish those in first place, and the only thing you can do about it is…punish yourself? You might call these evasion tactics skill-based, but they’re so counterintuitive to a racing game. Holding on to items like the mushroom or bullet bill means you have to forego the protection of a normal shell or banana, and intentionally leaving first place or driving off the course don’t intuitively sound like great tactics for winning a race. But it’s not just blue shells. The bullet bill, designed to give a huge boost to players at the back of the race, makes you relinquish control of your kart. You can set the controller down for its duration. Red shells automatically hone in on the person in front of you. Boo steals a random item. The blooper and lightning also give you no control. The piranha plant and superhorn require some skill in timing and position, but not much. The starman gives you invincibility and increased speed, which is great, but that invincibility renders all other items useless–they’re just pretty images on the track. The only skill-based items in Mario Kart are the green shells, which you have to aim correctly and avoid when they bounce against walls; the mushrooms, which work with the level design to provide shortcuts; the bob-omb, which has to be both aimed and timed to hit somebody with a blast; the boomerang and fireflower, which also have to be aimed; and the bananas, which are…kinda boring. In fact, I’d say they’re all kinda boring, except perhaps the bob-omb and the boomerang, but even those share the same strategy with the other projectiles. Avoiding all of these items is fun, though, because they force you to take different routes and drive off the optimal path. And that’s what I mean when I say that Mario Kart is a racing game with handicaps. The driving is solid, fun, skill-based, intuitive. But even if you manage to master it, you can lose control over the race based entirely on chance. Perhaps by personal preference, I feel that players should be rewarded for honing their driving ability. I also think that the very best players are the ones who can evaluate the situation they’re in and respond to it correctly. The success of dealing with these situations due to mastery of the game and its controls—that’s the reward. My problem with the blue shell, the bullet bill, the lightning, and even the red shell is that there’s nothing you can do about them. The point of these items is to level the playing field and keep everyone near each other, so that it’s a tight race, which is more fun. But I would argue that a better design would be to provide items which are evadable, given enough skill in the game, so that the very best players are rewarded with success. Frustration is not fun. There’s nothing more frustrating than seeing the finish line, driving in first place, and getting hit by a succession of items that put you in second, third, fifth place. It’s not fair and I don’t think it abides by the same ethos as other Mario Games. Sonic & All-Stars Racing Transformed, aside from being a mouthful, is a great game. It has a diverse and interesting single-player mode, bonkers courses which give you control over multiple vehicles in a single track, and some great items. GameMage on Youtube describes the blue shell analog in Sonic pretty well. Instead of directly hitting the player in first, the swarm item places obstacles in front of them, as well as any players right behind them. These obstacles can be destroyed by projectiles or avoided with good old-fashioned driving. The other items in Sonic are pretty skill-oriented, too. It seems that Sumo Digital put a ton of thought into how they designed their items. I’m not sure about the theming, though. Diddy Kong Racing takes a different approach. While it does have heat-seeking missiles and invincibility items, there’s no random chance involved. 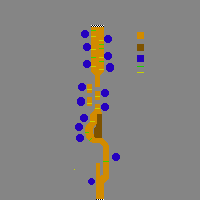 Items are picked up by driving into colored balloons which denote which item is inside. Driving into the same color of balloon multiple times will power up your items. This lets you choose a strategy for each race: I know I can pick up two red balloons and get a heat-seeking missile if I take this route instead of the other, or I could give up the missile and take a blue boost balloon instead. While the items themselves don’t always test your driving skills, picking up the correct item and making a strategy do. Look, the point of the blue shell (and other items I’ve mentioned in Mario Kart) is to keep all the players in one big mosh, so that it’s always a tight race. Because driving way ahead of or way behind the crowd in Mario Kart is boring. You’re welcome to disagree, but I just played some time trials and, while the driving feels great, the game feels boring. Mario Kart needs other players. So here’s the part that’s really a personal preference, but which I truly believe: Mario Kart should be fun to drive alone, with no items, on an empty course. The items should complement that. That’s not to say there should be no items at all, on the contrary! Mario Odyssey has been praised by an enormous wealth of people for how fun just moving is, but it wouldn’t be a game if all you did was move. That movement is simply the foundation of a rich system of mechanics. And a lot of that comes down to the enemy and level design in Mario Odyssey. Why are we talking about 3D platformers? Because Mario’s 2D and 3D platformers are known for fantastic level design which complements Mario’s moveset and keeps each level unique and interesting. Easy levels have fewer, gentler turns; hard levels have sharp, frequent turns. Shortcuts are dotted around that can be reached by skilled players if they know where they are. Obstacles and enemies force you off the straight, ideal path. Players can choose between tight turns or boost pads. Sure, it’s more nuanced, but those are the big things that come to mind. I’m not ragging on this either. This is a good formula for making a track in a racing game. My problem with it is that kart-racing games could do so much more. If you haven’t heard of Mark Brown’s Game Maker’s Toolkit, then you’re missing out. Take a look at this video. Essentially, Super Mario 3D World uses a four-step level design which introduces a concept, tests your ability, twists it, and then gives you a chance to show off. Now imagine this in a kart-racing game. Your first thought might be that it couldn’t work because of the lap structure, to which I retort: Mount Wario is a great, non-looping course. Alternatively, Mario Kart already has levels which change over time, so it’s not impossible to make an experience like this. In DK Jungle, there are these big screaming pillars that push you back when gliding. It’s a simple mechanic and not entirely unique, but if used correctly, I think they could be fun. Here’s my imaginary, ideal style of track using the screaming pillars. The track, like Mount Wario, is linear, so you don’t loop back to the start line. At the start is a straight path which forks into two roads. The left-hand road is a fake-out; you can’t reach it, because a screaming pillar to the left of the track blows you toward the right-hand road. They also have bad breath. Now that you’ve seen what a screaming pillar does, when you see another ahead of you, you get pretty scared—it will push you into a bottomless pit—but just before it is a boost pad, and you find that going so fast lets you avoid the danger. Suddenly, you’re armed with the knowledge that the screaming pillars will blow you off-course, but if you can get a boost before them, you won’t get blown. Now for the test: you’re faced with a curved road lined with screaming pillars. If you powerslide, you can hit the boosts to avoid them, but if you miss the boosts, you’ll be blown onto a slower track down below. At the end of this gauntlet is a screaming pillar with no preceding boost-pad: instead, you have to realize that jumping off a ramp and doing a trick will boost you past it, introducing another layer of skill. And the twist? For the next section of the course, you have to use the screaming pillars to your advantage. The track is broken up into platforms like the end of Grumble Volcano. At each platform is a screaming pillar preceded by a ramp. The platforms are staggered to the left and right, so you can’t just drive in a straight line. Instead you have to get pushed by the screaming pillars so that you’ll land on the next platform. If you take the boost, you’ll drive straight into death, so you have to recognize the layout of the course and choose to get blown to the side. The blue circles are screaming pillars; the green bars are boostpads; the yellow bars are ramps. And finally, the end presents you with a series of screaming pillars, ramps, and boosts. Sometimes the boosts are in front of you; sometimes they’re only reachable if you’ve been blown by a screaming pillar. So a player who’s learned the mechanics of the track will be able to skillfully decide for each ramp whether they should do a trick or not to hit the next boost pad. I’m not saying it’s the best design, but to me, that sounds like the start of a great new style of Mario Kart track. 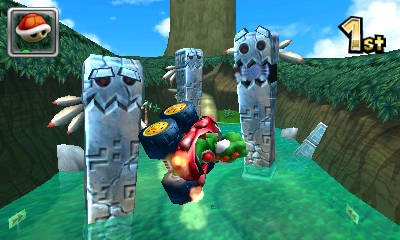 Even if a player has mastered the mechanics of the karts, they still have to master the mechanics of the level. The most obvious criticism to my own criticism is that, well, Mario Kart receives great reviews and sells very well. There’s no reason for Nintendo to switch up the formula. However, I’ve never met a person that didn’t enjoy Mario Kart at least a little bit. Kart-racing is a great genre. It’s perfect for couch multiplayer. Unfortunately, the kart-racing genre is in a slump right now. There really aren’t many options besides Mario Kart, especially on PC. Sonic and Super Indie Karts are there for the PC Gamer, but the lack of variety is astounding. These suggestions might be better fit for a new, indie kart-racing game. I might even make it myself. Let me know what you think. Tell me I’m wrong or add more suggestions, I want to hear it!